The start of a new year is always a good time to re-evaluate your rental documents, and make sure you are maximizing the protections you have in your lease agreement. Last year, a number of landlords were prosecuted for adhering to a strict no-pets policy. HUD has taken the position that the Fair Housing Act applies not just to service animals, but to “companion” animals as well. That means a landlord must carve out an exception for a companion pet so long as it is prescribed by a doctor for a person with a disability. This applies not only to tenants, but to their guests. Landlords cannot restrict those animals from any portion of the rental property, including common areas like laundry rooms, or charge the tenants more money. Landlords with no-pets policies face an increasing number of prospective tenants who want to keep a pet. This trend is encouraging some landlords to consider a pet-friendly policy. If you simply decide to allow your good tenants to have a pet, but don’t update your lease, then you may soon realize you need a more comprehensive pet policy. Not only is it clear that nonsmoking is the future for profitable rentals, but the converse is also true. Allowing smoking in a rental building has become risky now that several judges have decided secondhand smoke is a nuisance, and have allowed tenants with related illnesses to sue their landlord. With this precedent, landlords who allow smoking have an ever-increasing duty to eliminate secondhand smoke in their buildings. It may be time for you to add a nonsmoking policy to your lease agreement. Existing leases which allow smoking will need to be grandfathered in. After an alarming number of grow-op busts this year–many involving rental properties, police are warning landlords to properly screen tenants, and to perform routine property inspections. If you include a provision in your lease that warns tenants of periodic inspections, you provide them with a reason not to commit crimes in your rental property. Dozens of cities across the country made news this past year by passing rental laws which require landlords to keep tabs on their tenants in an effort to deter crime. These laws include a requirement that landlords evict problem tenants or face fines–sometimes on a daily basis until the tenant in gone. Often, these rules don’t require a conviction. Some don’t even require a police report. Yet, your standard lease agreement may require a landlord to prove the criminal activity in order to score an eviction. Landlords need an ironclad lease provision giving them the right to file an eviction immediately in the case of crime or disorderly behavior. Many criminals come to the rental property by moving in with an existing tenant. Make sure your lease regulates guests, spelling out how long someone can visit before they need to sign a lease. It should be clear that anyone signing the lease must undergo a criminal background check, and the lease should prohibit guests who are known to have a criminal history or are prone to violent, criminal or disruption behavior. Victims of domestic violence gained added protections this past year. For instance, it now may be illegal to evict the victim of such a crime or their children if the crime was committed by a guest or co-tenant. Be careful with blanket language that doesn’t deal with this “new” contingency. Keep in mind the victim may be allowed to break the lease early for their own protection. Needless to say, a landlord does not want crime on their rental property. The International Crime Free Multi-Housing Program continues to offer an effective training course for landlords that has been proven to deter crime. This program includes a well-drafted Crime-Free Lease Addendum. It’s worth noting that a couple of cities –including Cedar Rapids, have passed rental ordinances requiring the Crime Free Lease Addendum as a condition for obtaining a rental license. Lawyers are reporting an uptick in the number of lawsuits initiated by tenants. The majority of these disputes are over security deposit deductions. The likely reason for the increase is cash-strapped tenants who have little to lose by dragging their landlord to court over deductions. Also, be clear that a shared deposit will only be refunded at the end of the lease term, in the event a roommate moves out early. Tenants today are more likely to contest an eviction, especially the ones who are living rent-free. These pros are smart, so be sure your lease doesn’t give them fodder for a dispute–inappropriate or illegal provisions in your lease can cost you in court. Review your attorneys fees provision. If you don’t have one, ask your lawyer if you should add it in, because that is the only way you will be able to collect your attorneys fees should you prevail in a lawsuit, regardless of who files the case. Some local rules prohibit a provision that only allows the landlord to recover attorneys fees, and a couple of places forbid attorneys fees provisions altogether, so find out what the law is in your area. There also have been a number of disputes reported where landlords and tenants simply disagree on who is responsible for what. For instance, one northern city is seeing a record-breaking number of icy sidewalk complaints this year. If the landlord isn’t clearing the snow, and the tenant says they don’t have to either, chances are the local municipality will be doing it, and billing the landlord. Utilities are another major area of dispute, as a number of towns have started billing landlords for their tenants’ delinquent water bills. Make sure these rights and responsibilities are clearly stated in the lease so there is no room for confusion, and so you have a way to collect the money from the tenant if need be. 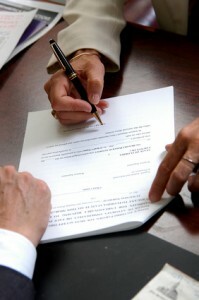 For additional information on allocating landlord and tenant rights and responsibilities, see www.tenantsinfo.com. Whenever you make changes to your lease agreement, it is always a good idea to run it past your attorney. This is a good way to get caught up on any changes in the rental laws that affect your properties. So gather your lease, your notes and your questions, and bring them along to discuss with your attorney before your next vacancy. If any problems arise with your rentals, you’ll be glad you have an updated, bulletproof lease. Where is the share button? The comment about utilities brought to mind another question since we pay the water bill for our tenants. If a tenant doesn’t pay the rent, can the landlord have the water cut off? Would a clause to that effect have to be included in the lease?